1.Whilst I understand the need to manage time in a full agenda, why did the Mayor not give Julia Redfern some latitude to ensure that her case was fully heard prior to the debate. She was ‘guillotined’ at 5 minutes. She was reading from a script so she could have confirmed the time remaining and a judgement made? DCC response : The five-minute limit is set out in the Petitions Scheme. It was communicated to the lead petitioner in advance of the meeting. It was specifically referred to in the report. It was verbally mentioned by the Mayor before the speech began. The five-minute limit was strictly applied throughout the meeting to all speakers to whom it applied. 2. Why were the questions raised by Councillors Williams, Graves and Naitta in the meeting not answered as part of the debate ? DCC response: There is no provision in the Rules of Debate for individual questions to be answered. The matter is put, debated and voted upon. 3. Why was there not a vote on the motion presented in the petition, as opposed to the one to ‘note the motion’? DCC response: A motion was proposed in the report compiled by officers. It is for members to decide whether to formally propose a motion. No member formally proposed the motion in the report. Derby News Comment : So, the officers proposed the impotent “note” motion, and didn’t think to advise the petitioner that, in the interests of open democracy, they should identify a proposer to motion the report. I’m sure many members would have come forward. 4. Does the Mayor consider that a debate actually took place, in line with the prescribed protocols? If so, please explain the basis for that view? DCC response: The debate was entirely consistent with the laid down procedures. 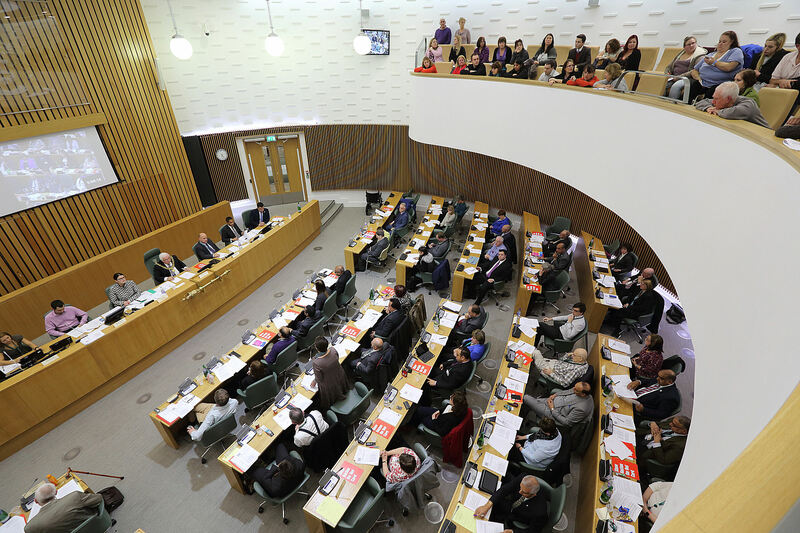 Derby News Comment: The DCC Rules of Debate state – “CP57 The mover of a motion has a right to reply at the end of the debate on the motion, immediately before it is put to the vote”. This did not take place,….so the debate was inconsistent with procedures! Derby City Council may have been correct on a pedantic technically. 250,000 citizens would all have agreed that a “debate” didn’t take place, and that those who sat in the chamber and who represented them were part of a ludicrous travesty of democracy. Thank you Russell Pollard in supporting us the way you do. Several people ran over their five minutes, especially the mayor. It just showed to me how much the mayor didn’t care about the tas and support staff of derby. It just makes us stronger. Julia – thanks. It didn’t feel that all aspects of the meeting were so tightly controlled. It should increase your resolve! I only once attended a district council meeting [in support of a disabled persons sailing club]. If I ever attend another there are things I learned from that meeting thay may be helpfull. Anyone could apply to speak and you are told of the time limit. Presume that the 5 minute rule will be adhered to. Those appealing should work together to make the time allowed more productive. Reading from a script that takes longer than 5 minutes is a silly mistake. Either time it beforehand, or get more than one person to speak, then once they cut you off, pass it on to the next person or make sure they have a copy. Not sure if this is allowed, but it seems the obvious thing to do. These are not debates as such, you speak, they speak, the councillors officers may even have a slide show, then they debate and then vote. A local objector turned up on the day and made her objection on the grounds of disturbing rare species. No proof was asked, they just heard her and voted against the proposal.